Alrosa PJSC, the world’s largest rough-diamond producer, sees demand for polished gems and jewelry stabilizing this year and will look to maintain prices as the market recovers. 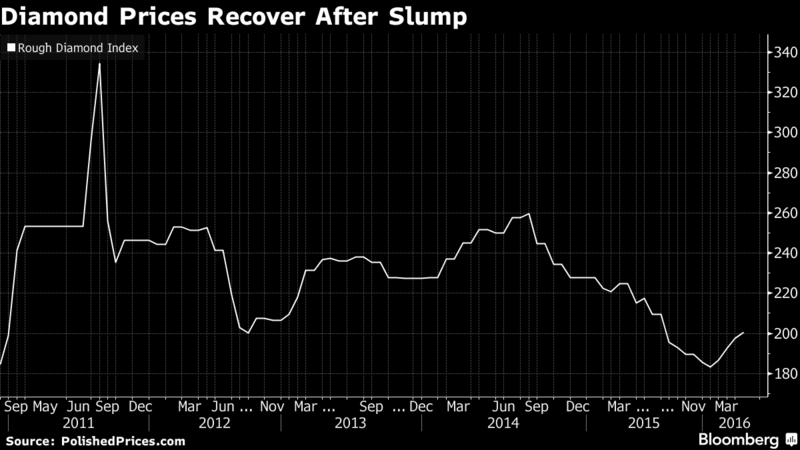 China’s slowdown and an industrywide credit crunch pushed prices down 18 percent last year, the most since 2008. That prompted the biggest producers, De Beers and Alrosa, to choke off supply to bolster prices, leading to shortages of some stone types and helping to boost demand this year. The two companies control almost two-thirds of the market. While De Beers cut prices for gems this year before raising them for the first time in more than a year at its April auction, Alrosa has kept them stable in all its 2016 trading sessions. Lowering them would result in losses for clients who purchased the gems earlier, meaning they would need to reassess stocks and potentially destabilize the market, Zharkov said. "There is a competitive cooperation between diamond companies. Price competition isn’t the driver for this market,” he said, adding that Alrosa’s future pricing policy will depend on market conditions. The first-quarter recovery in diamond prices helped Alrosa more than double net income to a record 49.2 billion rubles ($746 million), it said in a statement on Tuesday. The miner’s shares have jumped 29 percent this year. Polishers have increased purchases of rough gems to replenish stockpiles, the CEO said. That became possible because in the second half of 2015, Alrosa, De Beers and other producers allowed clients to cut their excess inventories, valued at more $3.5 billion, which they started accumulating in 2013, Zharkov said. Purchases by U.S. consumers may increase 2 percent to 3 percent this year, he said. While Asian demand isn’t declining, buyers favor smaller stones. The first quarter will probably be the strongest in terms of sales this year, and the overall global diamond market will be better in 2016 than 12 months earlier, Zharkov said. Alrosa revised its output target for 2016 and now sees it at 37 million carats, while previously it gave a range of 34 million carats to 39 million carats, Zharkov said. The miner had about 22 million carats valued at $2.5 billion in stockpiles at the end of 2015. This declined more than 20 percent by the end of the first quarter, Zharkov said. The company plans to cut this to a “normal” level of 12 million to 14 million carats over three to four years. It may happen much sooner if demand resembles that seen in the first three months of the year, he said. Alrosa won’t seek to add gems to inventories. The Russian government, which controls 44 percent of the company, is preparing to sell a stake of as much as 10.9 percent. The option of a share sale in Asia, including Hong Kong, should be considered, Deputy Prime Minister Yuri Trutnev said in an interview with Tass this month. 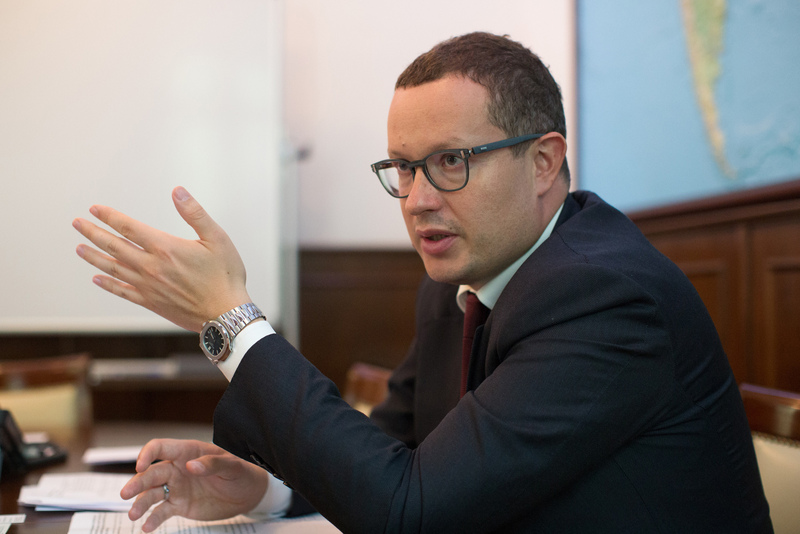 A Hong Kong listing has yet to be studied and isn’t an option for the imminent stake sale, which will be done in Moscow, Zharkov said. About 5 percent of Alrosa’s sales are in China, and this may double in the future, he said.